A SEVERE THUNDERSTORM WATCH has been issued for all of north central and northwestern Illinois counties until 4 am cdt early Sunday morning. A warm front lies to our west while a strong low level southerly jet has developed to our west into Iowa, and will begin to shift to the east overnight. The main threat is large hail up to one and one half inches. There is also the threat of isolated super cell severe thunderstorms capable of producing wind gusts to 70 mph. Some thunderstorms may linger into Sunday morning. The warm front will push through by around 6 am, following soon after by a cool front sweeping southeast across Wisconsin, northeastern Iowa and northern Illinois. The clouds will break up and it will be much warmer in the afternoon with a high reaching into the low 70's. The front will stall out from southern Indiana across southern Illinois into western Illinois and southeast Iowa by Sunday evening. Skies will be partly cloudy on Sunday night with a low in the low 50's. On Monday the front will begin to shift toward the northeast and another surge of moisture will begin to rush northward from the Gulf of Mexico into the Midwest, It will be unseasonably warm again with a high around 77 degrees. The front will work it's way into the Stateline during the overnight hours on Monday night bringing the area a good chance of showers and thunderstorms. Showers could linger into Tuesday as the frontal complex crosses the northern part of Illinois. It will be cooler under partly cloudy skies with a high in the low 60's. High pressure is expected to take control from Wednesday through the end of the week providing the area with plenty of sunshine. Temperatures will top out in the low 60's. However , a slow moving low pressure system over the southern plains bears watching. If it were to trend toward the northeast, the end of the last half of the week could be cooler with inclement weather. Here is an article from the Midwestern Regional Climate Center and what their thoughts are on the recent warmth during March and what climatology tells us about the last spring freeze date in the Midwest. 8:30am Update: Other than a light shower or two, the rain has ended and a couple breaks in the cloud cover will be found this morning. There has been some fog that has formed back in Iowa and across northwest & north-central Illinois behind the rain but it isn't expected to last too long this morning. 5:45am Update: The heaviest of the thunderstorm activity has moved east this morning, however there have been a few pop up showers/storms near Davenport, IA - southern Whiteside and Lee counties. These scattered showers/storms will continue through mid-morning with mostly cloudy skies remaining into the afternoon. Storms could actually redevelop just south of Chicago and into northwest Indiana later today ahead of the main low pressure system. Something to keep in mind if heading east today. Low pressure over north-central Missouri early this morning will keep showers, with a few embedded storms, going for the next couple of hours. The storms are moving into an environment that is a little more stable than where they originated from Thursday evening. Severe weather is not anticipated but moderate to heavy rainfall can be expected along with possible pea-sized hail. Dom Castaldo sent this article to the weather department yesterday afternoon and I found it very interesting. Haven't seen any farmers planting yet around here, and Dom stated he's seen farmers plowing but not planting any seeds where he lives. Many farmers in the U.S. Midwest are seeding their corn crops early, betting on the warmest March on record against the odds of a potential damaging late-spring frost, according to reports. The early-planted corn, which some analysts say could be a record crop, may miss the peak summer heat in July and result in an extra 60 cents per bushel in September, say the growers, who are banking on high demand and low stocks to place a premium on end-of-summer deliveries. The possible setbacks of early planting include forsaking certain types of crop insurance and the unpredictability of the weather. "It's going in good but we have fear that it might come too quick and a frost will come and kill it," said Ethan Cox, an Illinois corn farmer. Farmers are hoping to get a premium for their early crops before the height of the harvest. Tight supplies in summer 2011 pushed cash corn prices to record highs across the region as grain buyers rushed for the grain to supply the first purchases of U.S. corn by China in four years. Increasing demand from ethanol refineries, which now use 40 percent of the domestic crop, also has increased demand. "This early planting means harvest will likely be early as well," said Karl Setzer, analyst at MaxYield Cooperative. "A result of this will be the ability to pick up the (price) increase in the market between old and new crop. In many cases this will add $1.50 of revenue to a bushel of corn." The annual Fermilab severe weather and tornado seminar is approaching quickly! As usual, WGN Meteorologist Tom Skilling will be there as the event's MC and it will take place at Fermilab in Batavia, IL. This year's topics will range from the array of destructive weather events in 2011 that amounted to $14 billion in damage to the 45th anniversary of the Belvidere/Oak Lawn tornadoes of 1967. Speakers will include Dr. Russell Schneider, director of the Storm Prediction Center, and extreme weather photographer Jim Reed. For more information on the event, click here. As Chief Meteorologist Ty Sheksy pointed out yesterday evening, Tuesday's high of 74° was the 12th time we've reached 70° or higher during the month of March! That broke the previous record of 11 days back in March 1910! Wow! The average monthly temperatures is just a little over 53° which puts us at a whopping 16.7° above our monthly average. A west/northwest wind will keep highs this afternoon in the mid and upper 60s, but still above average. A secondary cold front will move through late morning switching winds around to the northwest and allow a drier air mass to move in. During the day today wind gusts could reach 30 mph but as the evening nears winds will begin to calm possibly allowing patchy frost to develop overnight. Cloud cover from early morning showers in eastern Iowa will continue to fade this afternoon leading to a little more sunshine and temperatures getting close to the low 70s. The cold front remains back in central Iowa and this is currently where most of the moisture resides. A narrow axis of higher dew point readings, in the mid and upper 50s, lie right ahead of the front. Going forward into the afternoon winds will remain gusty as they shift around to the southwest. Wind gusts have already reached close to 40 mph in many locations across the area. Storms are expected to develop right along the front as a mid-level jet streak (area of stronger winds) moves through north-central Iowa sometime after 3pm or 4pm. Most likely we may begin to see those storms pop in eastern Iowa and far northwestern Illinois and quickly move east into the evening. Widespread severe weather isn't anticipated, however, storms that do develop will be capable of producing large hail (due to drier air above) as well as damaging winds. The tornado threat remains low but there could be enough wind shear in the lowest levels of the atmosphere to cause a few of the individual storms to rotate. We'll continue to monitor conditions going through the afternoon and provide updates here as needed. A strong low pressure system will lift into the upper Great Lakes later this afternoon with a cold front trailing behind. Storms have already started to develop just east/southeast of Des Moines, IA along the front but also in an area with better moisture and warmth. They'll likely weaken some as they run into a drier, cooler air mass across eastern Iowa. There is a lot of dry air behind the front in the upper levels of the atmosphere and this may actually help storms fire back up going into the afternoon. Strong south/southwest winds will help pull moisture northward ahead of the cold front later today, but since the main low will remain well north of area widespread severe weather is not anticipated. Current indications are suggesting isolated thunderstorms will develop late afternoon (roughly between 3pm-9pm) across sections of Missouri and Illinois and move east. Should storms develop, instability may be just enough to support individual, isolated storms capable of producing damaging hail as well as damaging winds. Temperatures this morning are more typical of where we should be at the end of March, but it sure is chilly outside! To add insult to injury a chilly rain has been falling across much of northern Illinois. Heavier rain is now falling near Freeport and points south near Forreston and Baileyville. While a rumble of thunder or two can't be ruled out look for this chilly rain to continue through the morning as a stationary boundary lies across Illinois. A Bit of a Jolt Back to Reality on Monday! The largest and coldest Canadian air mass to have an impact on the upper mid west since March 9th is dropping temperatures tonight. That's the bad news. The good news is that the Stateline had a fabulous day on Sunday with a high of 76 degrees... a full 25 degrees warmer than the average high of 51 degrees on March 25th. A sprawling Canadian high is centered over the northwestern portion of Ontario near Hudson Bay. Temperatures in the vicinity of the high on Sunday afternoon were about 10 above zero with dew points near zero. A back door cold front swept down the length of Lake Michigan, and then pushed toward the west across the Rockford Metro area this evening. The wind shifted to the east and northeast following the passage of the front, and temperatures dropped into the 40's from the Lake Michigan shoreline westward to just east of Rockford by 11 pm. Dew points are also dropping tonight, and the low temperature overnight will reach down into the upper 30's by daybreak. No frost is expected in the Stateline tonight with skies becoming mostly cloudy later on and a brisk northeasterly wind picking up. However, Freeze Warnings have been issued by the National Weather Service for portions of northeast Wisconsin, and the northern half of lower Michigan., and Frost Advisories are in effect for southern lower Michigan, the northeastern half of Indiana, over into Ohio later tonight. It could be even colder tomorrow night. There is a great deal of concern about the vulnerable fruit crop in Michigan because of the advanced stage of bud development brought on by the recent extended unseasonable warm spell. The progress of the fruit crop is between 2 to 4 weeks ahead of normal because of the warm weather. Temperatures will jump around a bit this week, and the chilly temperatures on Monday will not last long. A strong weather system over the northern plains on Tuesday morning will draw a warm front across the Stateline during the day, and temperatures will recover into the middle to upper 60's by late Tuesday afternoon. Showers and thunderstorms will be possible in advance of a cool front which will push across the area in the evening. Wednesday will be mostly sunny, and temperatures will be comfortable in drier air behind the front. Low pressure has moved off to the east, but no cold air has followed in behind it. The air is still relatively moist with dew points in the 50's. So, it will remain mostly cloudy tonight. As the temperatures drop off overnight, the dew points will be reached, and areas of fog will develop after midnight. The overnight low will be in low 50's. The fog will burn off shortly after sunrise on Sunday, and skies will become mostly sunny. It will be a delightful day with light northerly winds, and an afternoon high in the low 70's. A cold front will edge southward across the Stateline during the afternoon into the evening hours. No precipitation is expected with the passage of the front. A large Canadian high pressure centered over northwestern Ontario will bring northern Illinois the coldest temperatures the area has had in about 2 weeks with temperatures dropping into the upper 30's. Frost is not expected because clouds associated with a disturbance over the northern plains will spread southeast across the area overnight There is a slight chance of some light showers toward daybreak over far northwestern Illinois. An increasing pressure gradient will begin to develop between the Canadian high and the low pressure over the northern plains. Northeasterly winds will pick up on Monday to 10-15 mph under mostly cloudy skies. It will be a chilly day with a high only in the upper 40's with a slight chance of light rain showers. There is a fair, to a good, chance of showers and thunderstorms developing into northern Illinois with that system over the northern plains by Monday night and Tuesday. A warm front will move from southwest to northeast across the area on Tuesday boosting the afternoon temperature to near 70 degrees. The system will drag a cold front quickly back through northern Illinois by evening. It will be cooler, but still well above average, on Wednesday under mostly sunny skies. A re-enforcing Canadian cold front will drop temperatures again on Wednesday night into the upper 30's. It will be mostly sunny on Thursday with a high in the mid to upper 50's. The Canadian ridge of high pressure will shift off to the east by Friday morning. A warm front will develop from around Omaha, Nebraska southeast through northern Mississippi. A disturbance associated with the front will pull Gulf of Mexico air up and over the front increasing clouds a setting the stage for a good chance of showers and thunderstorms by Friday afternoon. Chances of showers and thunderstorms will continue until the passage of the warm front across into southern Wisconsin, which looks like around noon time on Saturday. Once again northern Illinois will be bathed in unseasonably mild air with afternoon temperatures reaching the 70's. Skies for the most part have remained mostly cloudy, however, we have had a few rays of sunshine break through as of early this afternoon. A severe thunderstorm watch has been issued downstate closer to the center of the low as it moves out of Missouri and into southern Illinois. Where there has been a little more filtered sunshine a few pop up storms have developed southwest of Chicago and are currently moving north/northwest. Going forward this afternoon I would anticipate a similar situation to what we had yesterday where storms developed mid-afternoon and lifted north into Wisconsin. While the greatest instability remains in southern Illinois whatever little sunshine we do have will help make our environment a little more favorable for storm development. Heavy rainfall, hail and gusty winds all remain possible with any storms that do form. Low pressure, cut off from the main flow in the jetstream, will continue it's slow trek northeast this afternoon. Out ahead of it showers are currently moving through Chicago and southeast Wisconsin with some sunshine trying to break through across the Stateline. Scattered showers/storms could redevelop again this afternoon as we experience a little more sunshine and as the low moves closer. By early next week high pressure will move across the upper Great Lakes giving us more of a northeasterly wind. This may create what's known as a 'back door cold front'. Typically a cold front will approach from the west, northwest or north. A back door cold front is a front that approaches from the east/northeast. This could be the case as winds flow down Lake Michigan and cause the lakes shores to be cooler than surrounding locations. It's possible, though, this front may push further inland across north-central Illinois causing temperatures to fall into the low 60s during the afternoon. As a result, I did lower high temperatures for Monday to 60°. Now, should winds not be overly strong we may in fact be a little warmer will places east stay cool. Rainfall overnight and skies partially clearing early this morning lead to some locally dense fog, especially west of Rockford. Visibility has been improving over the past couple hours but is still down to about 3 miles near Freeport, Monroe and Galena. There may be a little haze left going through the afternoon as skies remain mostly cloudy. One of our viewers, Felicia Gonzales, sent in this photo of the fog in Chicago this morning! 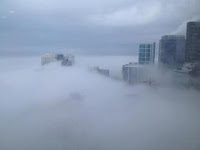 As she put it "The creeeeepy fog in Chicago". THUNDERSTORM NEAR KIRKLAND...MOVING NORTHWEST AT 30 MPH. BRIEF HEAVY DOWNPOURS...ARE POSSIBLE WITH THIS STORM. OR SMALL INTERIOR ROOM UNTIL THIS STORM HAS PASSED. 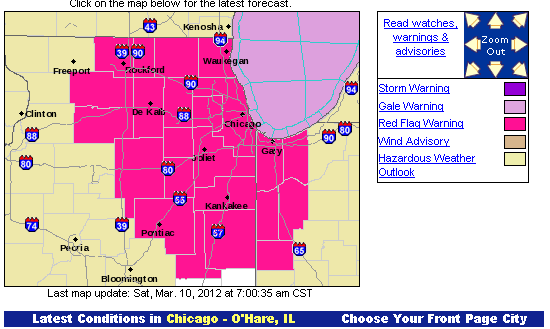 742 PM CDT THU MAR 22 2012 ...SPECIAL WEATHER STATEMENT. AT 740 PM...NATIONAL WEATHER SERVICE DOPPLER RADAR INDICATED A STRONG THUNDERSTORM NEAR ELBURN...MOVING NORTHWEST AT 25 MPH. UP TO NICKEL SIZE HAIL...WINDS GREATER THAN 40 MPH...BRIEF HEAVY DOWNPOURS...AND FREQUENT CLOUD TO GROUND LIGHTNING ARE POSSIBLE WITH THIS STORM. LOCATIONS IMPACTED INCLUDE... ELBURN... MAPLE PARK... ILLINOIS HIGHWAY 64 EAST OF SYCAMORE. PRECAUTIONARY/PREPAREDNESS ACTIONS... GUSTY WINDS MAY CAUSE SMALL OBJECTS SUCH AS TRASH BINS TO BLOW AROUND. HEAVY RAINFALL CAN LEAD TO FLOODING OF LOW LYING AREAS SUCH AS DITCHES...VIADUCTS...UNDERPASSES...CREEKS AND DRAINAGE AREAS. SEEK SHELTER IN A STURDY STRUCTURE UNTIL THIS STORM HAS PASSED. Wednesday will likely be another record breaking afternoon as highs rise into the low 80s. The sunshine expected for today will fade to cloud cover later this evening and Thursday as low pressure moves into the western Great Lakes. Moisture from the Gulf of Mexico will be in full supply, as it has been for folks in the south the past couple days, as each little upper level disturbance that rotates around the main low. Rain will increase in coverage from southwest to northeast Thursday morning with potentially heavy rainfall setting up by Thursday evening. Rainfall totals could approach one inch by Friday morning in some spots across northern Illinois and southern Wisconsin. Scattered showers and storms will last through Friday as the upper level low slides southeast. Cooler temperatures aloft will be associated with the low so it's possible should we see any sunshine Friday afternoon thunderstorms could develop allowing the threat for hail. The unusual warmth is being felt all the way up to the US/Canada border as well. Places like International Falls, MN and Marquette, MI are also experiencing their warmest March on record. In fact, people were seen swimming in Lake Superior over the past few days! (Here are pictures as proof.) Just 9 days ago, I was cross country skiing in the Marquette area! (Here is proof of that). At left is an image of the current situation about three miles above the surface. (The United States is near the bottom-center of the screen.) You'll notice the big ridge in the eastern US, and an upper-low over west Texas with a broad southerly flow between the two features supporting thunderstorms in the Plains. Later this week, this upper-low will "chip-away" a little at this ridge bringing slight cooling. A trough dropping in from Canada will do the same thing later next week with temperatures perhaps getting below freezing at night. Overall, however, the next couple of weeks look to be above normal with this warm ridge of high pressure hanging around. This means that March 2012 has a very good chance of being our warmest 3rd month on record! WHICH IS IN EFFECT UNTIL 8 PM CDT /9 PM EDT/ THIS EVENING. * WINDS...SOUTH 15 TO 25 MPH WITH GUSTS UP TO 35 MPH. The string of record breaking warmth ended yesterday when highs fell one degree short of the record high of 78° set back in 1921. Expect mostly to partly sunny skies the remainder of this afternoon as a mid-level ridge of high pressure builds west across the Great Lakes. A deep trough out west has forced the jetstream northward across the Midwest, Great Lakes and East Coast. When looking at the Current National Temperature map you can tell where the dip (trough = cool temps) in the jestream is and where the ridge is. This will continue to provide unseasonable warmth while showers/storms move across the central and southern Plains. Severe weather is likely across parts of east Texas, Louisiana and Arkansas later this afternoon while a few storms may develop in Iowa as moisture and a little instability build north. This is all due to an upper level low that will eventually become cut-off from the main flow in the jetstream. Most of the rain/storm activity will stay to our west the next couple of days because the mid-level ridge will act as a blocking mechanism and not allow much activity to move east. It's not until late Wednesday and even Thursday that the ridge will eventually break down as the low moves northeast. Rain chances, as well as cloud cover, will increase towards the end of the week and going into the weekend keeping temperatures 'cooler' as highs fall back into the 60s. And now our calendar days will match what the temperatures have been the past week! Spring officially began at 12:14 am; otherwise known as the Vernal Equinox. Meteorological Spring began March 1st and will go through May 31st. I keep running into a familiar question these unusually warm days: "Do you think we'll get below freezing again this spring?" My answer to that is, "Yes!" I am almost certain of that. We must keep in mind that our *average* low is still below freezing at 29 degrees, and our record low for March 19th is -9! Based on the way the weather pattern looks over the next 10 days, I doubt we'll see any record lows and it is possible we'll escape freezing temperatures during this period. However, Rockford's average last freeze is April 28th and our earliest last freeze is April 7th -- almost three weeks from now! Here's more on this subject from the National Weather Service. From March 14th through the 18th this year, a daily record high temperature was set each day. That has us at five record highs in a row! The streak ended today, but only by a whisker as we topped-out just one degree shy of our record high of 78 set back in 1921. Today's 77 degree high also ends our streak of consecutive 80 degree days. We had four in a row of those; beginning on the 15th and ending on the 18th. Tomorrow's forecast calls for a quick return to the record high temperatures. If we do hit our forecast high of 81 degrees, we'll beat the old standard of 79 set in 1921. Wednesday and Thursday's highs will also be near or above previous records! 11:35am Update: Storms now moving through Freeport, Cedarville and eventually into Orangeville. Southern edge of the rain is lifting north of Rockford into Wisconsin. 11:30am Update: Showers will continue to lift north into Wisconsin through noon today, however, there have been a few heavier showers/storms moving through Jo Daviess county and now into central Stephenson county near Pearl City and just west of Freeport. Areas out in Jo Daviess county have received rainfall amounts of 1" to 2" as reported from trained spotters. As these storms continue to lift north/northeast it's possible an additional half inch could fall which may create some local ponding on roads or even some localized flooding. The showers/storms should become a little more scattered going through the afternoon. Moderate to heavy rainfall will continue to affect Forreston, Byron, Stillman Valley, Baileyville, Freeport, Pearl City, Lena, Warren, Shannon and Mt. Carroll this morning. Embedded storms will also occur within some of these heavier bands. Light rainfall is just southwest of Rockford and should begin to move into the Metro within the next 10 minutes. 8:20am Update: Heavy rainfall and thunder has been reported within the past 15 minutes from one of our weather watchers in Dixon. Rain is now beginning to move through Polo and Forreston. Scattered showers and storms are lifting north/northeast out of west-central Illinois this morning. These are forming out ahead of an upper level disturbance moving out of Missouri. While severe weather isn't anticipated with these showers heavy rainfall and frequent lightning will be possible. The heaviest of the rainfall appears to be right along the Mississippi River lifting north. The storms will continue into Whiteside, Carroll and Jo Daviess counties this morning. There is also a band of heavier rain, with a few embedded storms, moving into Sterling and eventually into Dixon. The unseasonably, unprecedented late winter heat wave continued through Sunday afternoon. Another high temperature record was set at 81 degrees breaking the old record of 73 degrees set in 1945. That is the 5th consecutive record high temperature. The last four of those records have been above 80 degrees. All of these records occurring during the last week of official winter. Prior to this heat wave there had never been a day warmer than 80 degrees during the winter season in Rockford. Records in Rockford go back to 1906. It will be a warm and somewhat humid evening... actually more like late May or early June, than mid March. A disturbance over Oklahoma early this evening will more toward the Stateline overnight. Clouds will increase after midnight, and there will be a slight chance of showers and thunderstorms late tonight. The low will be around 60 degrees tonight when the average low for this time of year is much cooler... near 28 degrees. The unseasonably warm weather will continue on Monday, but increased cloud cover associated with a disturbance moving toward the Stateline from the southwest may limit the temperature to the upper 70's in the afternoon. If there is less cloudiness than anticipated, 80 degrees will once again be a possibility. There is a chance of showers and thunderstorms on Monday and Monday night. The pattern is all jammed up so that very slow eastward progression of cooler weather in the western states will allow for the unseasonably warm temperatures to continue on Tuesday with another 80 degree afternoon possible along with widely scattered showers and thunderstorms. Clouds will increase, and scattered thunderstorms will again be a possibility on Wednesday. With the cool front still to the west, high temperatures will reach the middle 70's. The entire system will be making it's move into area on Thursday. It will be cloudy, rainy, and cooler with a high in the middle 60's. On Friday it will be partly cloudy. The system will have had most of its moisture wrung out by Friday, so only scattered showers will be possible. With the system of to the east on Saturday, there will still be a chance of widely scattered instability showers because of cold unstable air aloft. Lows will drop back to the 40's and highs will be in the low 60's. A disturbance early this morning caused some early season rogue severe thunderstorms to develop over north central Illinois and south central Wisconsin. 1" hail was reported over parts of northeast Rockford, and Belvidere. Skies cleared, the warm southerly flow continued today pushing temperatures to 82 degrees at the Rockford airport for another record high. The previous record was 75 degrees set in 2009. A pair of disturbances will move through the middle Mississippi valley tonight. One will pass well to our south, and it was causing showers and thunderstorms over central Illinois during the evening. Another will pass by to the northwest, and that may set off a couple of stray showers or thunderstorms later tonight. The systems will be off to the east tomorrow, skies will be partly sunny with the very warm, and somewhat humid air flow, continuing out of the south. Another record high of around 82 degrees is anticipated on Sunday afternoon. That will be the 3rd time out of the last 4 days that the Rockford airport has topped out at 82 degrees, and the 5th consecutive record in a row. It is not out of the realm of possibility that it could go higher than 82 degrees. Just as a matter of interest, the highest temperature ever recorded in Rockford during the month of March is 85 degrees set on March 29th in 1986. Weather records in Rockford go back to 1906. It will become mostly cloudy on Monday, so there is a good likelihood that 80 degrees will not be surpassed on Monday, but will the warm southerly flow continuing, high temperatures will probably reach the upper 70's, along with a slight chance of showers and thunderstorms. It will still be in the upper 70's with a good chance of showers and thunderstorms on Tuesday. It will be cooler on Wednesday with a good chance of showers and thunderstorms. The showery weather will continue under cloudy skies on Thursday. High temperatures will cool off to the middle 60's. By next weekend the high temperatures will only be in the 50's. 8:15am: Severe Thunderstorm Warning canceled for Boone county but continues for McHenry and northeast DeKalb counties. Storm near Marengo will continue to move northeast. Watch for heavy rainfall as well as hail with this storm. The storm will be near Woodstock shortly. There are also a few radar returns popping up in Lee and DeKalb counties that may need to be watched. A Severe Thunderstorm Warning remains for Boone, McHenry and far northeast DeKalb county early this morning. The main threat with this line will be hail, some of which could be large. Currently the back edge of this line is moving out of Rock and Boone counties. Look for the heavy rainfall and hail threat soon into Woodstock and Marengo. 0815 AM HAIL MARENGO E0.88 INCH MCHENRY ESTIMATED MARBLE TO NICKEL SIZED HAIL...WHICH FELL FOR ABOUT 5 MINUTES. LAW ENFORCEMENT ESTIMATED MARBLE TO NICKEL SIZED HAIL...WHICH FELL FOR ABOUT 5 MINUTES. (7:20 AM) Belvidere [Boone Co, IL] emergency mngr reports HAIL of half inch size (E0.50 INCH) at 07:10 AM CDT — estimated 1/4 inch to 1/2 inch hail. (7:07 AM) Loves Park [Winnebago Co, IL] law enforcement reports HAIL of nickel size (E0.88 INCH) at 06:37 AM CDT — lasted for a few minutes. (6:42 AM) Rockford [Winnebago Co, IL] trained spotter reports HAIL of penny size (M0.75 INCH) at 06:37 AM CDT — on the northeast side of rockford. lasted for a period of 5 minutes. 80+ Two Days in a Row! Yesterday we had our earliest 80+ degree high ever, and we did it again today! As far as I can tell, we've only hit 80 on two consecutive days in March once before in Rockford's history. In 1939, we had highs of 82 and 80 on the 23rd and 24th of the month, respectively. Tomorrow and Sunday, we're also forecasting highs of 80 or higher. If this forecast works-out, our streak of consecutive 80 degree days in March will reach four! There's an outside chance at 80 on Monday (we're going with 79 for now), and we think we'll see highs in the low-80s on Tuesday. So there's a *chance* of seeing six days in a row with highs at 80 or higher in March of 2012! Absolutely amazing. We are not even officially in spring yet, which begins next Tuesday the 20th, and temperatures lately are more typical of what would be felt in June! The past two days have reached record high temperatures; Wednesday's high was 79° and Thursday's high was 82°. Today we'll be back in the upper 70s/low 80s and that trend will continue into the weekend with more record highs in jeopardy. Not only is this warmth going to continue this weekend but it appears as if the remainder of March will be above average. As a deepening trough of low pressure in the jet stream pulls down cooler air along the west coast a strengthening ridge of high pressure will build across the Midwest and east coast. This will keep the warmth and moisture with temperatures likely near 80° once again Tuesday. Severe weather and heavy rainfall remain possible in the middle of the country as a cut-off low develops Sunday. We're not really anticipating much of a severe weather threat here next week because as of right now it appears as if that low will remain just to our southwest. Severe weather ripped through the Great Lakes Thursday late afternoon. Temperatures Wednesday afternoon soared into the upper 70s/low 80s with full sunshine and strong southerly winds. Looks like we'll experience a repeat this afternoon, just a little less windy but a little more humid. Dew points are in the low 60s. Rockford officially reached 79° breaking the old record of 74° set back in 1995. Patchy fog/haze has developed ahead of a weak cool front that extends from central Wisconsin back through eastern Iowa. This weak boundary also helped produce a few widely scattered showers overnight. The fog will spread across north-central Illinois and south-central Wisconsin this morning but should begin to diminish as the day progresses. The boundary will then stall across the Stateline this afternoon keeping temperatures in the middle 70s. An isolated thunderstorm remains possible through the afternoon and evening. The warm weather, that is. It seems like I'm the only Stateline resident who's sad to see our "winter" end in Rockford (I love winter recreation). But for the majority of us who are loving this almost summer-like warmth in March, here is a list of good AND bad things that come with the unseasonably warm weather across the eastern 2/3rds of the US. Another thing I thought of today that could be a negative -- and Eric Nefstead could have even mentioned it this weekend -- is the fact that the early blooming of trees and plants might set them up for a killing freeze later. Heavy rainfall from Monday combined with a generally light wind this morning has lead to the development of shallow ground fog. Visibility has dropped to a quarter mile or less, especially for those location closer to the Mississippi River. The fog shouldn't last too long this morning but watch for reduced visibility - especially in open areas. Temperatures this afternoon will rise into the upper 60's under high pressure but rise into the middle and upper 70s Wednesday and remain in the 70's through the weekend. In fact, we'll break our record high temperature for Wednesday which was 74° set back in 1995 and remain close to those standing records. Should we reach 80° tomorrow afternoon it would be the earliest on record Rockford hit 80°. The previous record is March 23rd, 1939! The strong upper low that was instrumental in bringing Gulf moisture, clouds, rain, and even some thunderstorms to the Stateline is off to the north, and moving away. Mostly cloudy conditions will give way to mostly clear skies tonight. It will be a little cooler with the ovenight low in the low 40's. No cold air is following in behind the departing low. High pressure will take charge of area weather providing sunny conditions on Tuesday. It will be mild with a high in the upper 60's. The exceptionally mild weather will continue all week. In fact, it will get even warmer on Wednesday with record breaking high temperatures likely. The record for Wednesday March 14th is 74 degrees.... set back in 1995. A line of convection has developed southeast of Rochelle early this afternoon and will lift northeast into DeKalb county. This line is currently crossing over I-88 and will be near Creston, Malta, DeKalb, Sycamore and Genoa shortly. Right now I'm not detecting any lightning strikes with this but there could be a few that develop shortly. Watch for some heavy rainfall. 12:15pm Update: The tail end of the showers/storms are lifting northeast out of DeKalb and McHenry counties. The line of storms that moved through formed in an area that had a little more sunshine early this morning. That combined with strong winds a few thousand feet above helped produce the storms. While we didn't experience much across the Stateline in terms of gusty winds, heavy rainfall and small hail were reported. Going forward into the afternoon we'll likely get a couple breaks in the cloud cover but the greatest threat for severe weather will remain just to our east, basically east of I-39. As the main upper low spins through this afternoon the possibility will remain for a few isolated storms. A Severe Thunderstorm Warning continues for Milwaukee and Racine counties in southeastern Wisconsin until 12:15pm. A line of storms has formed late this morning ahead of the main upper level low. This has been in an area that has seen a little more sunshine through the morning. The line extends from southeast Wisconsin back southwest through Marengo and Woodstock further south to Rochelle. Currently there are no watches or warnings, however, there has been a little rotation noted within the line moving across McHenry county. 9:55am Update: A few rumbles of thunder may be heard south of Dixon as a couple embedded storms have developed within the rain band. Heavier showers now just west of Rockford will continue to lift northeast. A large upper level low in Iowa will lift northeast into the Upper Great Lakes this evening. Showers overnight cleared the Stateline early this morning but an upper level disturbance lifting out Missouri has allowed shower activity to redevelop and lift into northwest Illinois. As the low moves closer this afternoon the current cloud cover may begin to break apart and allow for some heating to take place at the surface. Temperatures at the surface will warm into the lower 60s, but temperatures will quickly decrease with height as the low moves overhead. This may cause the air to become unstable and allow for afternoon thunderstorm development. Right now the greatest threat for severe weather would be northeast Illinois eastward into Indiana and Michigan. However, should storms develop closer to home hail along with gusty winds would be our primary threat. A strong upper low is located over Kansas as of 10 pm Sunday night. It will develop a low at the surface with a cold front trailing to the south across east Texas. There is a good inflow of Gulf moisture to the east of the system . Rain showers are spreading to the north, and will reach the Wisconsin border by midnight. With a brisk southerly wind persisting overnight, it will be very mild with showers, and some isolated thunderstorms. The area will get dry slotted on Monday morning cutting off precipitation. It will become partly cloudy with a brisk southwesterly wind. The upper low/trough will be moving across the area on Monday afternoon. With much colder air aloft, the atmosphere will become unstable, and showers and thunderstorms will re-develop. There is potential for some low topped severe thunderstorms during the afternoon into the early evening. The chances are slight, and the best chance of any severe weather will be just off to the east of the Stateline from McHenry and Kane counties east toward Lake Michigan. A bubble of high pressure from the northern plains will take control of area weather on Monday night. Skies will become mostly clear, and temperatures will drop into the middle 40's. The high will be over the area on Tuesday. It will be sunny with a high in the upper 60's. A warm front will sweep across the area before daybreak on Wednesday. A southwesterly wind flow will develop out of the southern and central plains. Skies will be sunny, and temperatures will soar to the middle, and perhaps even the upper 70's. A front will stall out across central Wisconsin on Wednesday night, and with the southerly wind flow, there could be some scattered showers and thunderstorms. The warm weather will last for the rest of the week with highs in the low 70's. Disturbances could cause some showers and thunderstorms on Friday and Saturday. Looking at the extended forecast for next weekend into the following week... it appears as if the warm weather will continue. An Amazing Warm Spell on the Way! A large area of high pressure is centered over the Delmarva Peninsula this evening. Southwest winds along the west side of the high brought dry mild air from the plains into the upper midwest on Saturday. Temperatures responded very nicely, and jumped into the unseasonably mild low 60's on Saturday afternoon. The winds have this evening, but will maintain 10 to 15 mph levels ovenight keeping temperatures from dropping any llower than the upper 30's. The average low for this time of year is in the middle 20's. The high will continue to dominate Stateline weather on Sunday morning under sunny skies. Southerly winds will not be as brisk as they were on Saturday, but it will be unseasonably mild with a high in the middle 60's. A developing low pressure are over east Texas will move to a position near Kansas City by Sunday evening. Clouds will increase during the afternoon, and rain showers will be likely Sunday night. There is a slight chance of thunderstorms, too. It will be very mild overnight with a low in the upper 40's. The low will continue to move northeast on Monday located near Minneapolis early in the day, and Iron Mountain, Michigan by Monday evening. An lingering showers will come to an end. It will become partly cloudy. No cold air will follow in behind the departing low, and the high on Monday will be around 64 degrees. A bubble of high pressure will follow in behind the departing system on Tuesday providing the Stateline with sunshine along with afternoon temperatures near 70 degrees. Wednesday looks even warmer with a high in the low 70's. The unseasonably warm, May like, temperatures will continue through Friday with a slight drop next weekend. There will be chances of showers and thunderstorms on Wednesday night, and again from Thursday night off and on through Saturday. Much Warmer Weather on the Way! Canadian high pressure will slide across the area early Friday evening. Skies are clear, and will remain mostly clear overnight with the exception of a few passing mid and high level clouds during the mid evening hours. It will become mostly clear again after midnight. Winds have become light southeasterly early tonight, and twill become southerly and pick up to 10-20 mph late tonight as the high shifgts off to the east. With the departing high off to the east on Saturday, and low pressure over southern Canada, winds will become quite brisk from the south, running 15 to 25 mph, with gusts to around 37 mph during the mid day hours. The relative humidity will be very low, and skies will be sunny, allowing for much warmer temperatures by afternoon. The high on Saturday will be near 60 degrees. With southerly winds continuing on Saturday night at 10 to 15 mph, the temperature will not drop lower than the upper 30's overnight. On Saturday night low pressure will develop over Texas, and move into Oklahoma by early Sunday. A brisk southerly air flow from the Gulf of Mexico will develop, pumping moisture northward through the Mississippi Valley on Sunday. Clouds will increase across northern Illinois, and scattered showers will be possible during the afternoon. The low will move to near Kansas City by 6 pm, and the rain will be likely overnight. The chances of rain showers will continue on Monday as the low continues to move across southeastern Minnesota and Wisconsin. It will be mostly sunny on Tuesday with a high in the upper 60's. It could reach 70 degrees on Wednesday, but a cold front approaching front the northwest could scatter some showers and thunderstorms across the Stateline on Wednesday afternoon into Wednesday night. No cold air will folow in behind the front. A re-enforcing shot of chilly air is moving southward across Wisconsin early this evening. Skies will be clear early, and it would be excellent for trying to get a glimpse of the northern lights that may grace the area overnight because of the recent strong solar flare, except for the fact we will have a full moon overnight. The cold front will push across the area around midnight or so, and there will be some clouds associated with the front, but no precipitation is expected. It will become mostly clear, and colder later tonight, with a low near 23 degrees by daybreak.. It will be sunny to mostly sunny on Friday under the influence of a weak Canadian high. The strong March sun will work on the cool air associated with the high, and moderate it in the afternoon to close to 40 degrees, which is just a few degrees below average of this time of year. The high will shift to the east of the area by 6 pm Friday allowing winds to shift back to the south. It will be mostly clear on Friday night with a low in the middle 20's. It will be breezy, mostly sunny and warmer on Saturday with an afternoon high in the middle 50's. On Sunday a good flow of moist air will push across the midwest all the way from the Gulf of Mexico. Low pressure in east Texas early Sunday morning will move rapidly north/northeast during the day. It will be mostly cloudy with a good chance of showers that will continue into Sunday night. There may be a few lingering showers into Monday morning. It will become partly cloudy with afternoon high temperatures close to 60 degrees. With the primary jet stream becoming more southwesterly, and shifting well northward into Canada, the Stateline will see unseasonably warm temperatures through midweek.. Highs will reach the upper 60's , and possibly even 70 during this next warm spell. A whole new way to study space and jet stream winds! Sometime this month NASA will launch five sounding rockets in approximately five minutes to measure 200-300 mile-per-hour winds at the edge of space. This mission will trace these winds and study their intimate connection to the complicated electrical current patterns that surround Earth. Video and more information can be found through this link! I encourage you to check it out! The latest two week outlook from the Climate Prediction Center is quite impressive; at least for temperatures. According to NOAA, this winter went down as the 4th warmest on record for the U.S. So, it should come as no surprise that this mild weather pattern is expected to continue through March. In fact, some long term forecasts are calling for the mild pattern to continue through spring with an increased threat for severe weather through the Mid-Mississippi River and Ohio River Valleys. Highs the next couple days will run roughly 20° cooler than what we felt Tuesday and Wednesday, but we're still going to be above average. The jet stream remains fairly strong and with no true cold blasts expected to occur temperatures across the Great Lakes have the greatest chance of running above average! Not only will this be felt across the Great Lakes but look at the U.S. as a whole. The only region expected to be cooler is the Pacific Northwest as well as Alaska. While it won't be overly stormy here, the mild weather may lead to an increase in rain/thunderstorm activity as we could see above average precipitation chances through the middle of March. Here's a look at current temperatures across the region as of 11am! Wind gusts however are nearing 40 mph in some spots! Tuesday evening the sun ejected a significant solar flare and it was one of the largest solar flares of the current solar cycle. 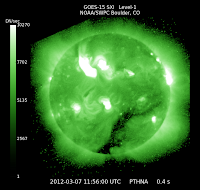 Solar radiation and geomagnetic storms are currently taking place and have reached strong levels this morning. This may lead to an increased chance of viewing the Northern Lights (Aurora Borealis) the next couple of days. Cloudy skies will be with us tonight but high pressure will move in Thursday night and Friday night allowing skies to clear. Snow potential for Friday increases!